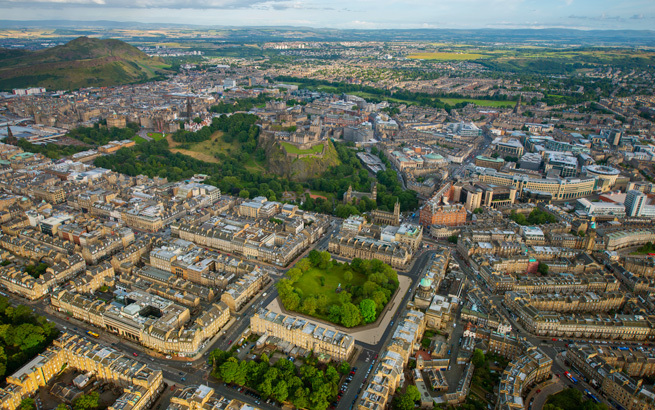 A company offering a unique alternative investment opportunity to investors worldwide is the latest to take up office space in The Charlotte Square Collection, in the heart of Edinburgh’s New Town. Truffle Farms Europe Limited (TFE) has moved into the lower ground floor of 31 Charlotte Square, sharing the beautifully refurbished Georgian townhouse with specialist financial service companies Ruffer LLP and SYZ & Co. The building is one of 21 premium office properties on Charlotte Square making up The Charlotte Square Collection, which has been the catalyst for the revival of the architectural icon of the Scottish Enlightenment as a one of Edinburgh’s most prestigious business addresses. Other occupiers within the Collection include Cazenove Capital, Old Mutual Global Investors, Handelsbanken and Hampden & Co.
Over the past six years, more than half of the properties within The Charlotte Square Collection have been refurbished. This programme of renovation has been made possible by the latest building techniques and technologies, that both respect the heritage of the buildings, their period features and elegance, while still creating premium, modern office spaces. “We are delighted to welcome Truffle Farms to Charlotte Square. Its distinct investment offering sits well alongside the private banks, family offices and bespoke fund managers that currently reside on the Square.